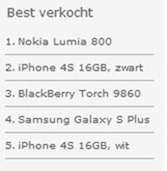 The Nokia Lumia 800 continues to conquer the charts in Europe, with the handset being the best seller on Expansys Sweden. The pink version of the handset is also the second most pre-ordered handset after the Samsung Nexus Prime. On Expansys UK the position is reversed, but the Nokia Lumia 800 is still the second most popular device, after the Samsung Nexus Prime, which is first. Of note is that the handset has maintained its best selling position on KPN in the Netherlands. KPN is the biggest carrier in the Netherlands. This is after the Samsung Galaxy S Plus attempted to rise up the charts but turned around at position 3 and is sinking down again. We don’t know how many thousand Nokia Lumia 800s are selling every week, but we suspect sales are more likely to be at the higher than the lower end of sales estimates. Thanks Denis for the tip.